Having gutters on your home is a good thing. Gutters can prevent water damage to your foundation and landscaping from heavy drip edge flows. But how do you choose the right ones? Whether your home has never had gutters or the existing gutters are in need of replacement, the tips here will ensure that your money is being well spent. Read this before calling in your local gutter installers. 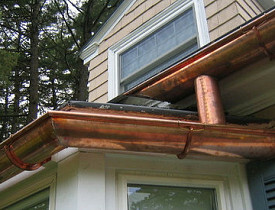 Gutter installation is not rocket science, but it is something that does require some basic engineering. A single run along the lower edge of a shed roof with a corner downspout is about as simple as it gets. Homes with multiple roof lines, various degrees of pitch and multiple gables add a level of complexity that requires a plan. The key factor in developing this plan is to scale the system based on the square footage being served and factoring in your potential for heavy downpours. The downpour factor is based on weather data and varies by region. A 5-minute “burst” of rain in Seattle is rated at only 2.1 inches per hour, while the same “burst” in Atlanta is 8.3 inches per hour. A 5” K style gutter is rated to move about 5500 sq feet, while a 6” version can handle over 7500 sq feet. A Seattle roofer will install different gutters than a roofer in Atlanta. Knowing what Mother Nature can throw at you will allow you to plan accordingly. Gutters make up half of the roof’s collection system. The downspouts make up the rest. Sizing here also can make the system perform properly. A basic 2 x 3 inch rectangular downspout is rated for about 600 sq feet, while a 3 x 4 inch spout can handle 1200 sq feet. One way to squeeze some more performance out of the system is to increase the slope of the gutter. Normal installs are typical at about ¼” of slope in 10 feet, with downspouts needed about every 40 lineal feet. As an example: if you have a 50 foot run, a downspout should be installed at both ends. For proper flow the pitch should be centered from the middle out to the spouts. Steeper pitch of the gutter allows the water to flow more freely and it helps with keeping the gutters free of debris. Extreme pitch, however, may look a bit wacky from the street and add complications in its install along the fascia. Here are the big questions many homeowners face when it comes to gutter installation: Do I need gutter guards? Do they work? Are they worth the extra money? Many gutter companies will insist that you need these. This is where you need to consider your local environment, maintenance schedule, and DIY ability. If your home is located in a forest that sees leaf or needle drop, you are more likely to need a gutter guard system. Gutter location will also dictate whether gutter guards are necessary. To illustrate, my home is in an area where pine needles are common. I had the seamless company install basic open gutters on 2 of my three eaves. The third eave, over 30 feet in the air, drips along a seldom-traveled area of the yard. Because that part of the home is also on pier footings, my concern for water infiltration was minimal. Clearing the gutter there would be a complex and risky process, so I had gutter guards installed on that side only. Your choice to install guards should be based on your local situation. Despite the claims of gutter companies, many gutter guards will still require a little periodic cleaning. Certain designs make this process far worse than an open top system … so the benefit can be nonexistent. Get recommendations and multiple quotes from professional gutter installers to help you make an informed decision.